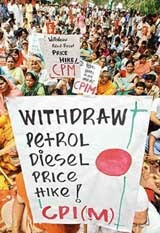 The Left parties, joined by regional forces like the Samajwadi Party and Telugu Desam Party, today staged street protests to demand the rollback of the hike in fuel prices as the Communists said the UPA government could not take their support for granted. Protests against fuel price hike across India. Petrol and diesel prices reduced in Goa. The Haryana Government will not charge value added tax (VAT) on the element of increase in the prices of petrol and diesel. Users of contact lens solutions, beware! The BJP today said that the party along with its NDA allies is going to intensify its agitation on the fuel price hike issue and condemned the Centre's proposed move to increase PDS grain prices along with a cut down in the quantum of grains being sold to poor. Amitabh Bachchan’s family is again in the news with reports of the Income Tax Department sending notices to Jaya and Abhishek Bachchan with respect to certain investments made by the family. A suspected grenade blast in a firing range of the Army at Bhojraj village in Hisar district of Haryana today claimed four lives, according to official sources. Another five were seriously injured in the blast. The government is likely to set up the sixth pay commission by next month to revise wages of its employees, five months after the announcement by Prime Minister Manmohan Singh. Early indications have now been received of revival of the monsoon current from the Arabian Sea side from June 19 onwards. With this, the National Centre for Medium Range Forecast (NCMRF) hopes that fresh rain activity will begin around June 19 over Kerala and coastal Karnataka that will gradually spread northward over Peninsular India. After health and tourism, it is education that is being used to build brand India. Taking note of the declining number of foreign and diaspora students in Indian universities, the government is projecting India as a destination for quality education at affordable prices.